You’veÂ maybeÂ already come along this screen on Youtube, stopping you from watching some popular music song. Or you wanted to watch a TV stream from your home country but their website said that you are in the wrong country. Here I’ll show you some simple methods how you can listen and watch anyway. If you want to understand more what’s going on, read this Wikipedia article about Blocking of YouTube videos in Germany. 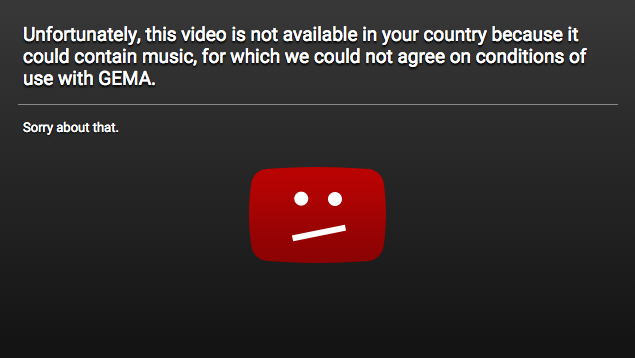 What you need to know for solving the problem: You must make Youtube believe that you are not surfing from Germany. And more generally speaking, we can also solve other problems related to this so-called Geo-blocking â€“ see point 2. This is quickest and cheapest solution for Youtube videos: Proxtube is an extension for Firefox or Chrome. After installing, when you browse to a blocked video, it will automatically reload the page â€“ but now through a proxy server outside Germany. The effect is: Youtube thinks you are not in Germany anymore, and shows you the video. The same principle works with an account at a VPN service: Instead of going on the internet and “directly” connecting to your browsed website, you first connect to a VPN server of your service, and then to the website. And that VPN server can be in any other place: Most VPN services offer servers from 26 up to even 141 different countries! So for instance, if you want to watch a live stream from Spanish TV but they only show it to viewers within Spain â€“ with a VPN service you can pretend that you “are” in Spain. Side effect: Your connection is always encrypted, thus it is much safer to use it on open wifi networks, like in coffee shops for instance. and search for some super-rare song (not in the top search bar, but the one a bit down,Â below the music player). I bet they’ll have it!